It all started up in the air (on a plane to be exact) when the idea for Thoughtfully sparked. It happened on a whim, really, from a simple place of passion and a desire to create. While we typically wouldn't recommend conceiving, conceptualizing, constructing and launching a print publication in just under four months, but opportunity knocked and our founder knew she had to open the door. Armed with grit and determination, our founder wanted to take the stories and people that had been inspiring her for over 15 years and share them with the world in both print and digital media and on her own terms. Shortly after, Thoughtfully was born in January 2015, hitting newsstands at Whole Foods Market stores across the United States. Today you can find Thoughtfully at Whole Foods in both Canada and the U.S., Sprouts, Natural Grocers, Barnes & Noble, Books-A-Million and more. We strongly believe in starting where you are, using what you have and doing what you can because we live it every day in our professional and personal lives. We're not here to convert anyone into tree-hugging hippies or vegans (although we wouldn't mind if they did) nor do we want to pressure you to "save" the planet or be more healthy. We'd much prefer that you make your own choices from a place of self-love and empowerment. Look at it more like nourishing your mind and body with what you need to thrive and not just survive. That said, we are here to share some great information with you and inspire you to live a bit more thoughtfully because we wholeheartedly know from experience that it's the way life should be lived. Brandie is the founder, publisher, editor and creative director of Thoughtfully Magazine. Desiring to create a truly toxin-free wellness + self-care publication that felt inclusive and authentic, Brandie came up with the idea for Thoughtfully in August 2014 and a magazine was born in January 2015. 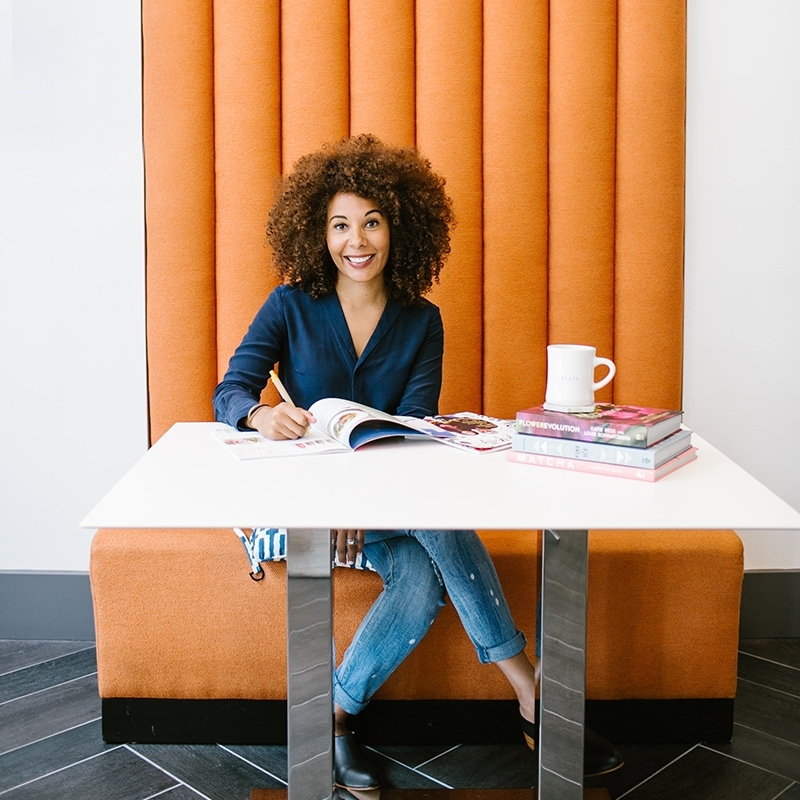 As a woman of color, Brandie is one of a handful of black female publishers/editors on newsstands in the U.S. and Canada. Originally from Northern Virginia, Brandie currently lives in Los Angeles with her husband and Lhasa Apso dog named Angel. Bianca is a passionate copy editor and writer from a small town just north of Toronto. With a background in communications and marketing, she is inspired by the power of authentic storytelling and expression. When her laptop is closed, you can find Bianca reading, listening to her favorite Hay House + Awaken Radio podcasts, getting her sweat on at kickboxing and yoga, or planning her next travel adventure. Abbey is a traveling designer with a passion for adventure and visual storytelling. When she's not dreaming about typefaces, Abbey enjoys discovering new places with her husband and getting to know the heart behind each new town she meets. Abbey finds her inspiration by immersing herself into the culture and letting herself wander and explore. Abbey currently lives in France by way of Brisbane and Copenhagen, but her true home will always be in the mountains of West Virginia. Julia is a multidisciplinary visual designer with a sharp focus on sustainability and the natural world. She is passionate about designing for social, political and environmental change. She strives to work in collaboration with other fields in order to create the biggest impact and never wants to stop learning and growing in the design field. A true California girl at heart, Kimberly moved from Ottawa, Canada to Los Angeles to pursue her love of photography. She wanted to further develop her unique aesthetic that blends sun-kissed surfer style with bright palettes and an eye for clean design and composition. Kimberly's lifestyle photos and editorials capture the magic of a single moment with the beautiful color and movement that she draws inspiration from every day. Dr. Tiffany Lester is an integrative medicine doctor, farmacy foodie and curly girl who believes we all have the ability to take charge of our health. Often, we just need a bridge to get to the other side and that's what Tiffany has been for hundreds of patients as Medical Director of Parsley Health in San Fransisco, CA. She is passionate about healing chronic disease through whole foods and teaching people how simple, small shifts can have an enormous impact on their fatigue, stress and pain levels.